D'Vorah is one of many characters introduced in Mortal Kombat X who has made the return trip to Mortal Kombat 11. Her mix of bugs, insect limbs, and tricks gave her a number of interesting tools to work with, which made her satisfying to learn. After speaking with senior NetherRealm QA analyst Steve Brownback about how she's evolved for the latest entry, it looks like she's become trickier, thanks to the game's custom variations system. But once you start diving into her variations, things quickly start to go off the rails. “[She has] moves that weren't even close to Mortal Kombat X moves," Brownback states. After getting the rundown on her, I’m inclined to believe him. From there, things only get weirder. “She has this new mechanic where she actually attaches insects to you, and they'll float around you, and then she can have them bite you when she chooses,” Brownback tells me. The opponent can’t shake these off and she can stack several of them at a time, so if these bug attacks land, you’re at risk of taking damage at any point she chooses to “detonate” the bugs while they're near you. She also has an ability that reminds me of a guest character from Mortal Kombat X: Jason Voorhees. "There's an ability you can equip where, when she dies, one of her babies comes out of her, and you control the baby,” Brownback says. “It has its own moveset, and then [your opponent has] to kill the baby to actually kill her." The move takes up two of the three slots you can use to equip moves, however, so it’s a major gamble. Despite her new tricks, her gameplan is still similar. “She's still this really good mid-range character,” Brownback says. “If you don't want to get in close, and you want to just pepper them with projectiles, she has one where a bug crawls out of the ground and will explode next to them." 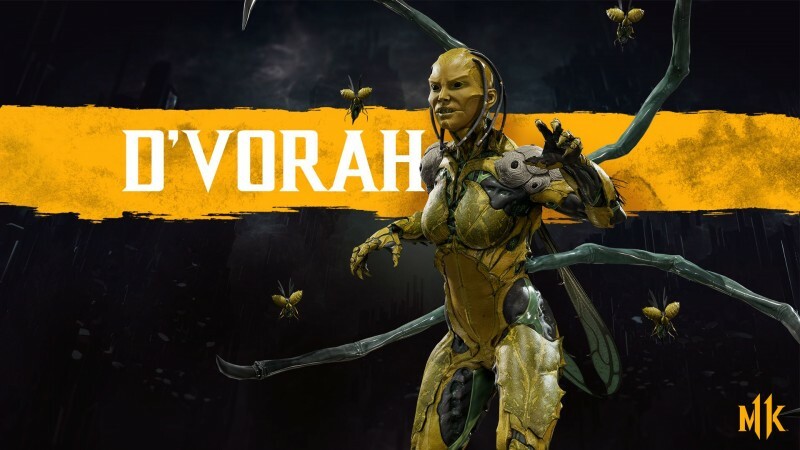 Sticking to Mortal Kombat 11’s overall direction of not giving characters too many strong low and overhead options, D’Vorah has a good low combo-starter, but no great overhead. She can lean into close-range aggression, however, thanks to an equippable overhead spinning move she can use in the air. “If you're playing a match where you just want to get in, do your mixups, you could use that overhead move," Brownback says. You could also combine a few of her moves to give her decent mix-up options; you could equip the low-hitting crawling bug attack, then use it to get in close and attack with the airborne spin move. The changes look to lean more into D’Vorah’s insect side, both mechanically and aesthetically. While it might make her look and feel less human, Brownback is personally a fan of the switch. "She looks gross in this game,” he says affectionately. “I thought she looked kind of adorable in the last game. But in this one she's just actually monstrous."